A versatile black overskirt with a side tie for adjustable ruching. A versatile black overskirt with a side tie for adjustable ruching. Can be let down to wear as a short skirt, or worn over almost any harem pants, yoga pants, or skirts for a layered look, modesty or fashion. Made of soft, stretchy rayon blend jersey fabric. Elastic encased waistband. XS/S/M U.S. Women's Standard Size 2 - 12. Waistband / High hip: 30 - 38 inches; Low Hip: 34 - 44 inches; Length (non-ruched side): 22 inches; Length (ruched side, unruched): 8.5 inches; Ties (each): 24 - 42 inches. M/L U.S. Women's Standard Size 10 - 16. Waistband / High hip: 32 - 42 inches; Low Hip: 36 - 46 inches; Length (non-ruched side): 23 inches; Length (ruched side, unruched): 8.5 inches; Ties (each): 24 - 42 inches. L/XL/2X U.S. Women's Standard Size 14 - 22. Waistband / High hip: 36 - 46 inches; Low Hip: 38 - 52 inches; Length (non-ruched side): 23 inches; Length (ruched side, unruched): 8.5 inches; Ties (each): 24 - 42 inches. Q: What is the fabric blend for this overskirt? I see it has rayon, what other materials are in the blend. 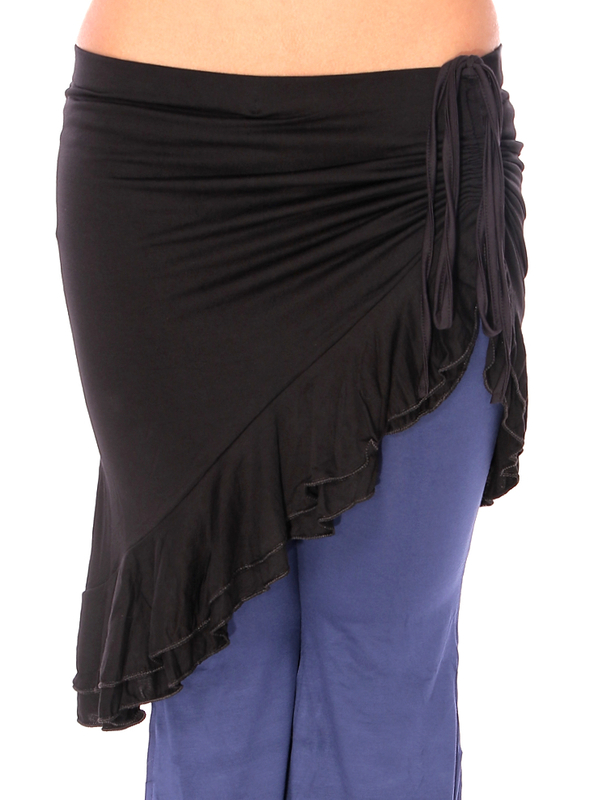 A: Hi Chelli, this comfortable and cute overskirt is 95% viscose (rayon) and 5% spandex.